The background has been made with my own stencil and distress ink. 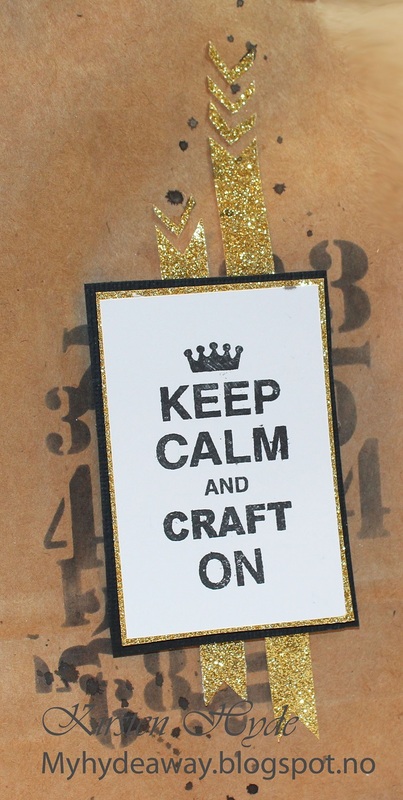 The golden glitter chevrongs has been cut from glitter cardstock. 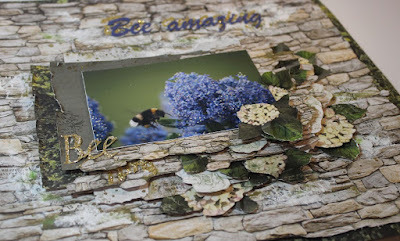 I used Rayher's Spring Wreath dies on glitter cardstock to create the cicle in the background. The measuringtape is washi tape. 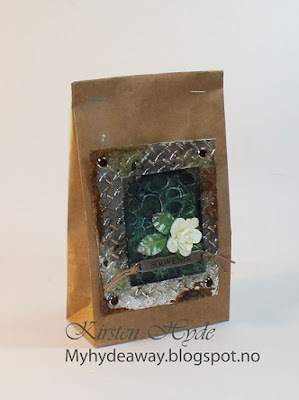 The text stamp is from Tim Holtz. The background has been made by covering a piece of Bazzill with metal tape. Then the paper was embossed with a Tim Holtz embossing folder. 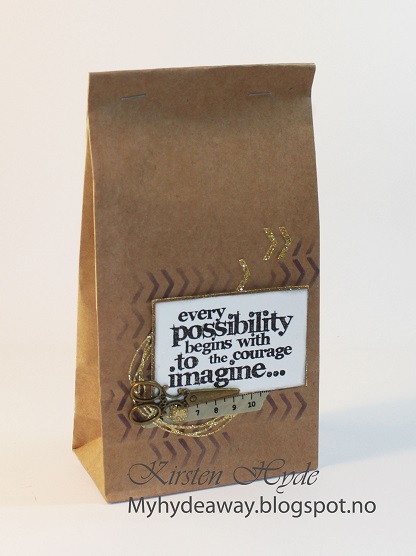 Then, the embossed tape was covered with black acrylic paint. Most of the paint was removed with a cloth while the paint was still wet. 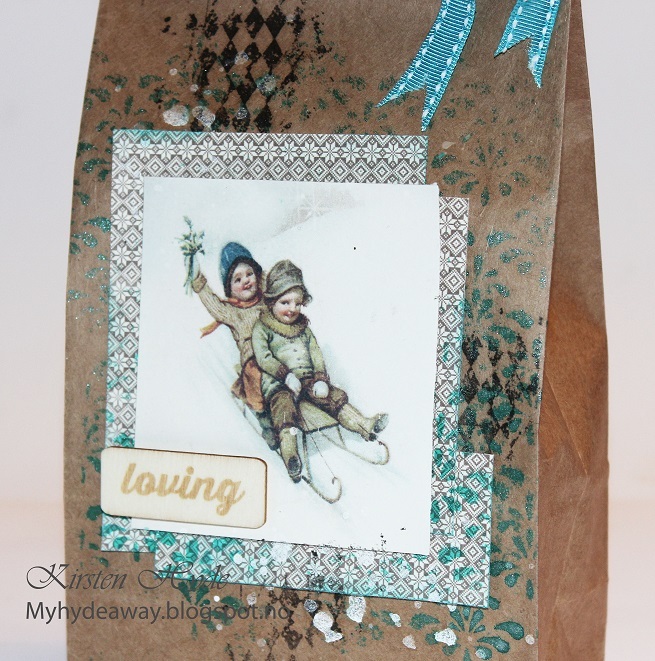 The edges has been distressed to get a "rust effect" with Vintage photo - embossing powder. 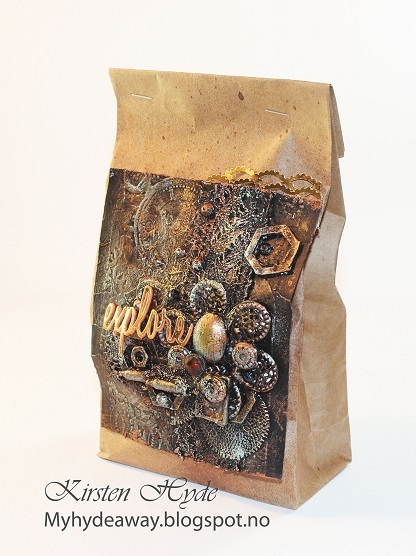 The metal tag is from Tim Holtz, Observations Metal Word Bands. 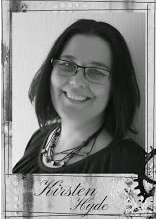 The rose is a Hobbykunst's Mathia rose. 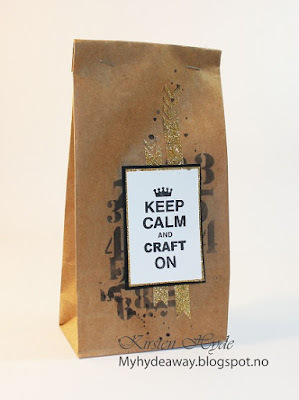 "Keep calm and craft on" bag. 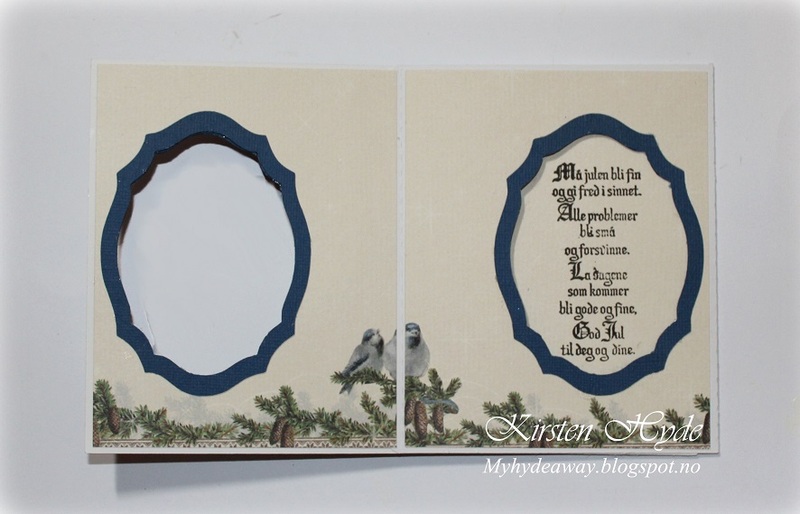 The background has been made with my own stencil and black distress ink. 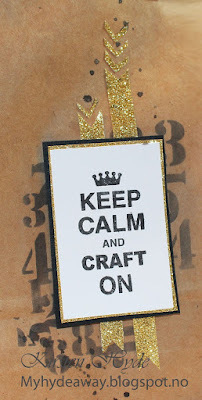 I have added washi tape in gold and added splashes with black acrylic paint. 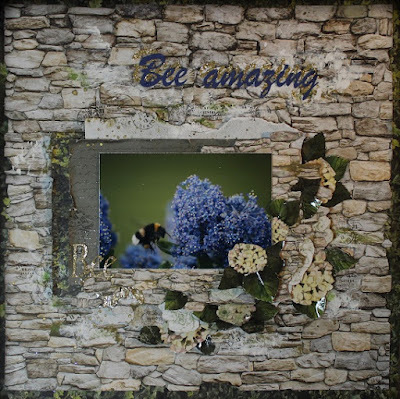 The mixed media motive has been made, by decorating a small piece of bazzill. The Bazzill has been dry embossed. 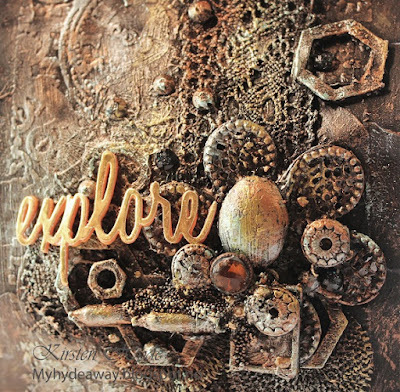 Then I glued old pieces of lace, metal, small light bulbs, diecuts and beads. Everything is painted black, and has been dry brushed with different acrylic colours. the work "explore" is a dies from Tim Holtz, dies out in craft foam and metal paper. The metal card has been glued over the craft foam. 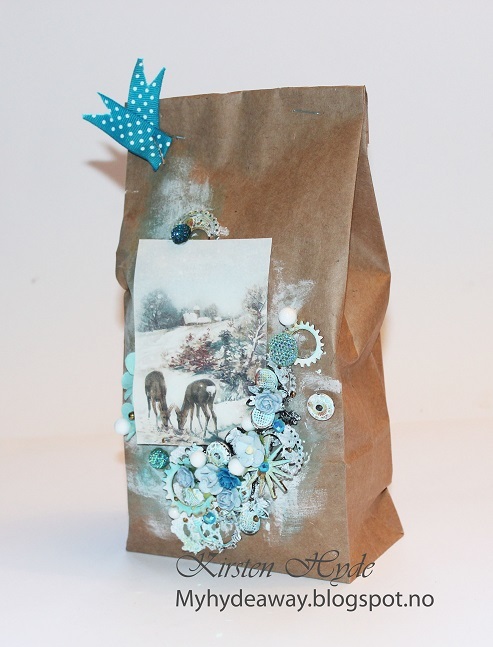 It is getting closer to Christmas.Today I am showing four new kraft bags, decorated in mixed media style. 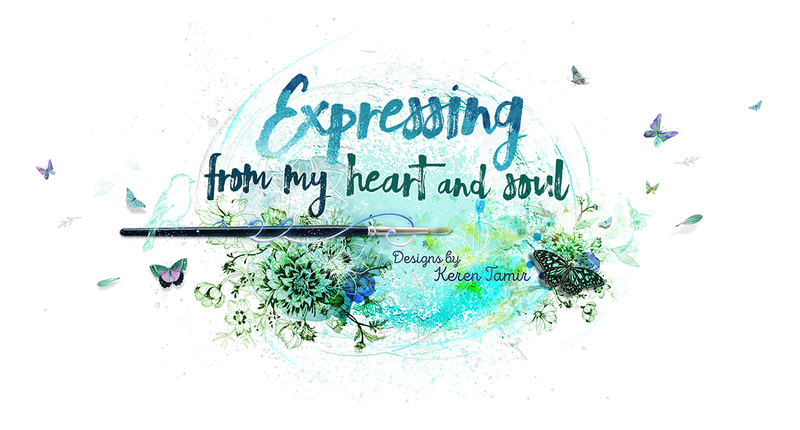 These are created for Hobbykunst. 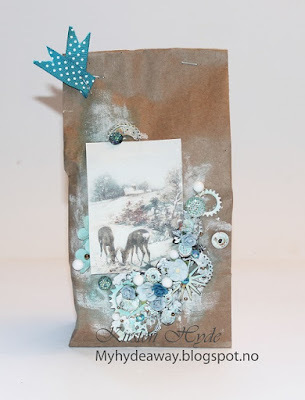 I have used simple kraftbags, and left over craft stash and paper. On this first bag, I have used paper from papirdesign - gave til far. Parts of the paper has been coloured with kaisermist to create a blue/green colour on the paper. 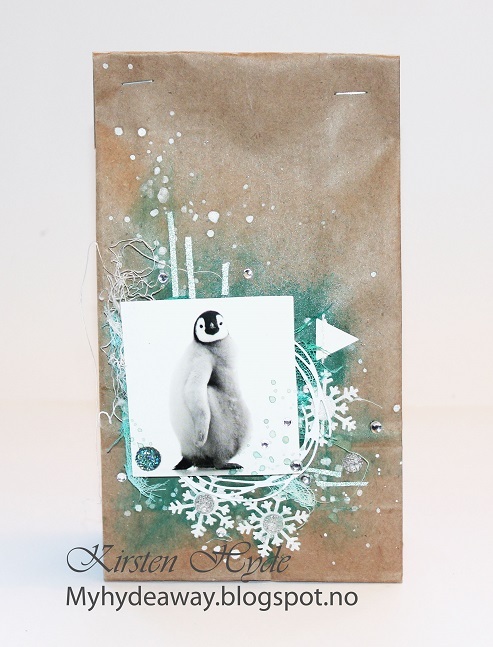 Gesso has been added with a cloth, to create the snow effect. It is also used small beads to create the snowballs. The stars on the top of the trees are Star brads, coloured in gold. I like using washi tape on backgrounds. Here, the tape has been fixed to bag, and then I have added white distress paint. 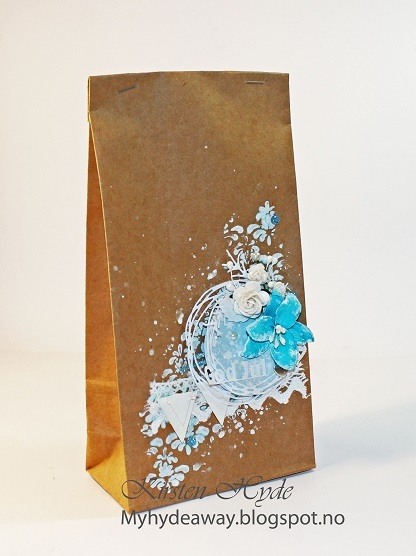 The triangle is from Rayher - white paper cord with pendanthe. 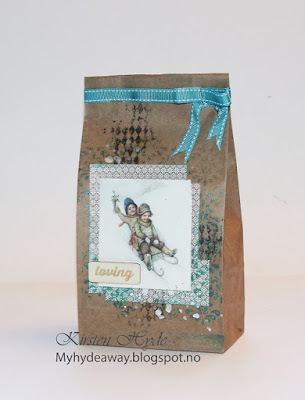 I have used a "Noel" stamp from Kaisercraft on the cork tag from Rayher. I have also used stickers on the background to create some effect. On this bag, I started to use glue over a stencil with circles. 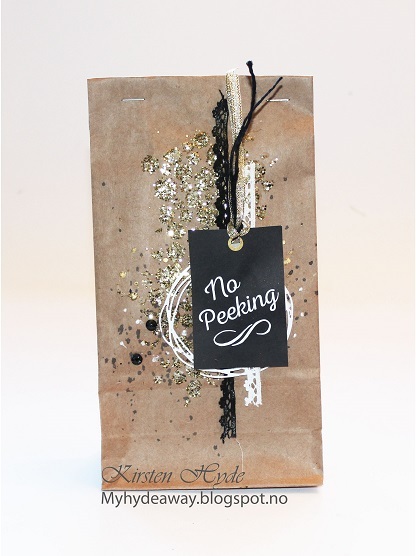 Then I added glitter the the bag. 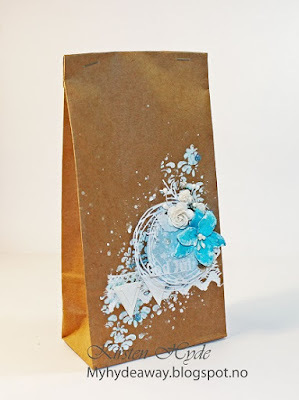 The bag was also sprayed with black acrylic paint. The lace is from Rayher. Part of the lace has been painted black before it was glued to the bag. The circle in the bag is created with Rayher's Spring Wreath dies. 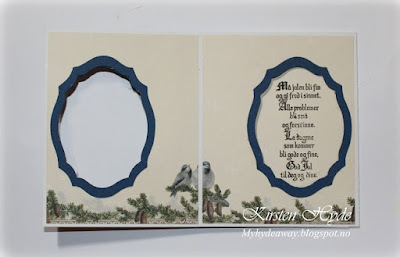 The background has been made with a stencil from Prima, gesso and Kaisermist. The lace is from Rayher. 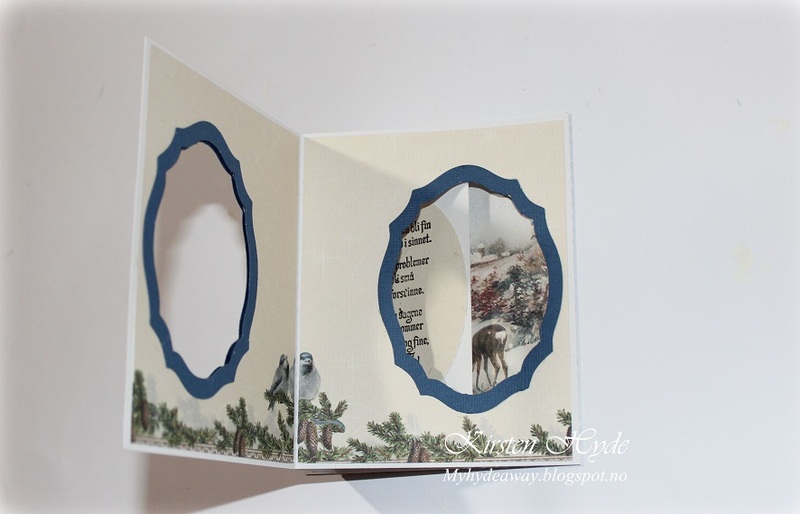 The circle is created with paper from Papirdesign - snøvær. Behind the circle, there is a diecut created with Rayher's Spring Wreath dies. The triangles are from Rayher - white paper cord with pendant. We are showing maritime cards with the Sail Away collectionin Kaisercraft's blog today. I have used papers from the small paperpad from the Sail Away collection. The base of the card is made from kraft. 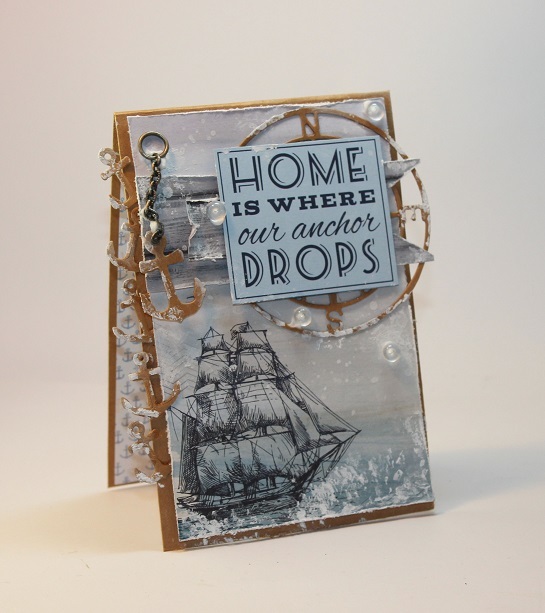 I have also used the two new Kaisercraft dies - sailing collage and anchors. The inside and the back of the card, is clean and simple. Kaisercraft products used: 'Sail Away Collection' PP985 Paper Pad | CT844 Collectables | DD730 Anchors C6 Die | DD 731 Sailing Collage C6. Other: Gesso and chain from an old jewellery. We are getting closer to Christmas. 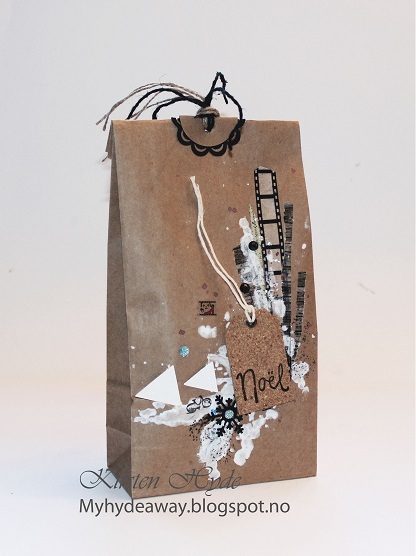 Today, I am showing four different mixed media kraft bags on Hobbykunst's blog. 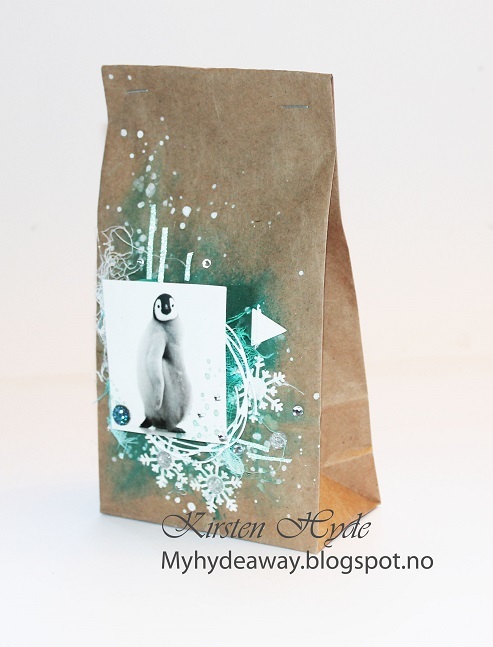 Bags like these can be used as advent calendar bags, neighbour gifts, or just a different kind of Christmas gift wrap. All the bags started of as simple kraft bags. 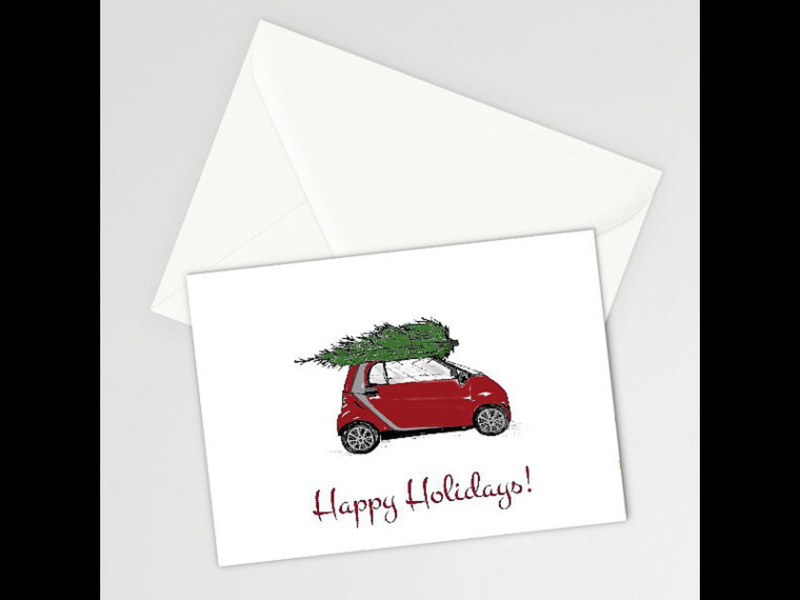 The motives are from Pion - Glistening Season and from simple small Christmas cards. The bag has been sprayed with Kaisermist. 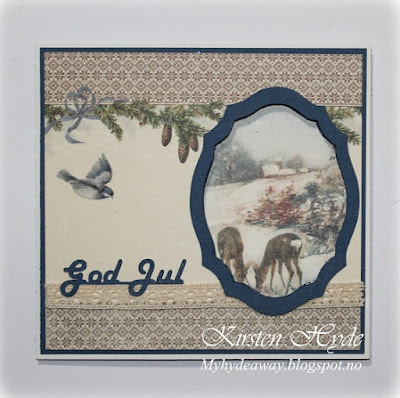 Det circle diecut is made with Rayher sin Spring Wreath dies. the snowflakes are made with Martha Stewart punch. The triangle is a pendant from Rayher - white paper cord with pendant. The motive is from a small Christmas card. 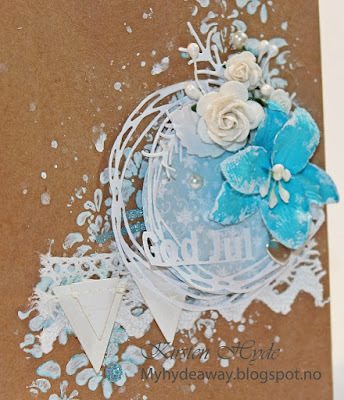 At the end, I have used some acrylic white paint and created the white snow effect. First, I collected a lot of different things, like old buttons, wooden figures and an metal ring from a soda can. These things were painted with blank gesso. The background was created, using a diecut (made with Sizzlits Frameworks Border dies) as a stencil Then the bag was sprayed with Kaisermist. A cheesecloth was coloured with ink and glued under the motive. The motive is from a small Christmas card. The triangles are from Rayher - white paper cord with pendant. 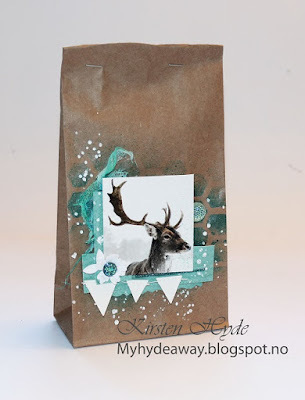 In the end, I added white acrylic paint as a snow effect. The bag has been sprayed with blue Kaisermist. 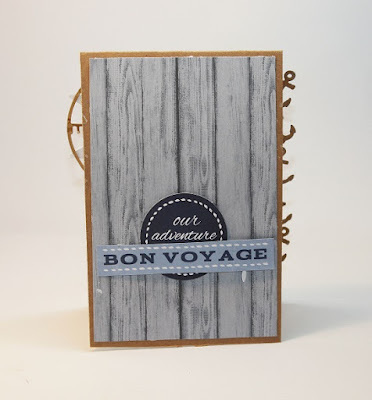 I have also used a background stamp from Kaisercraft to create the black effect. I have also added some spray of white acrylic paint to create the snow effect. The motive is from Pion - Glistening Season. 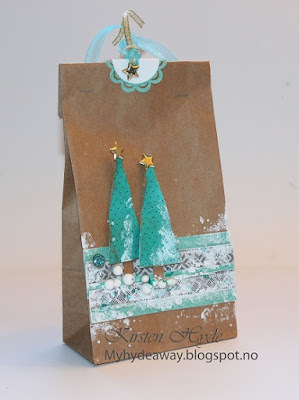 The patterned paper in the background is from the same Pion series, Glistening Season - By the River. .
More ideas for decorating kraft bags, will be posted in a few days time. 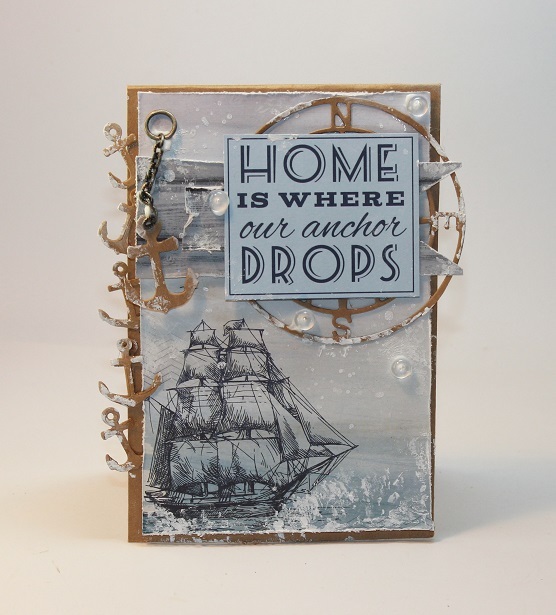 Today, Kaisercraft Design Team are showing maritime layouts with the Specialty paper from the Sail Away collection. The Speciality paper with the Paper Gloss effect, is a fantastic paper to spray and mist. 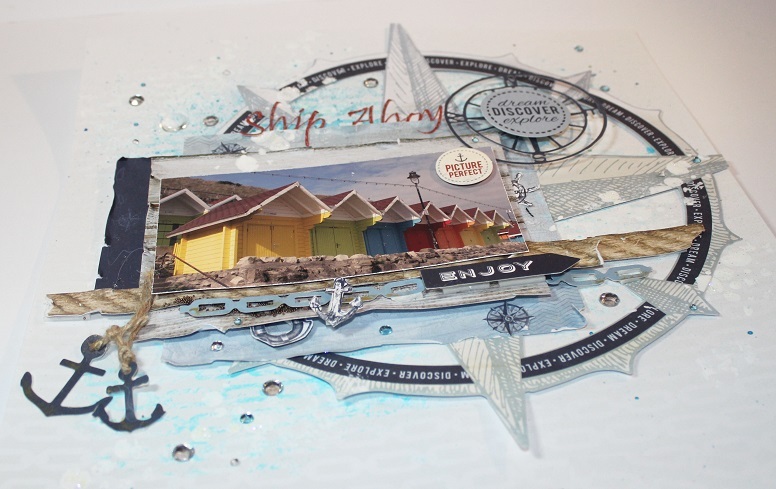 The colour of the sprays will only colour the background and not the glossy parts of the paper. The paper has been sprayed with Kaisermist and gesso. 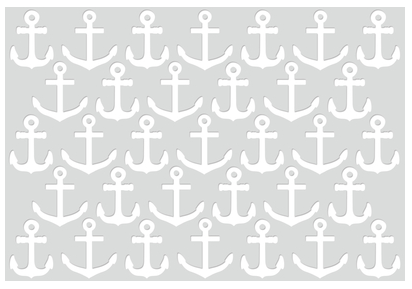 Kaisercraft materials: PS436 Chains Specialty Paper Gloss | PS435 Specialty Diecut Paper Compass | KM106 Collectables |PP985 Paper Pack | SS300 Sticker Sheet | DD731 Card Creations Sailing Collage C6 | SB700 Silver Rhinestone | Kaisermists: KM105 Turquise | KM106 Denim. 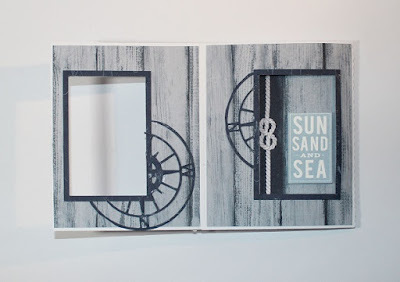 This month, I have created a Peek A Boo card for Kaisercraft, with the Sail Away Collection. The card is a Peek A Boo card. The image inside the window flips and changes for another image when you open the card. 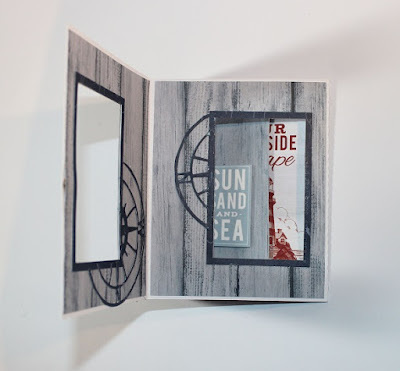 The window of the card was measured to fit the images on the papers. When you open the card, the image of the lighthouse disappears, and the sign with Sun, sand and sea appears. The compass on the background papers have been cut out from DD731 – Card Creations Sailing Collage dies. 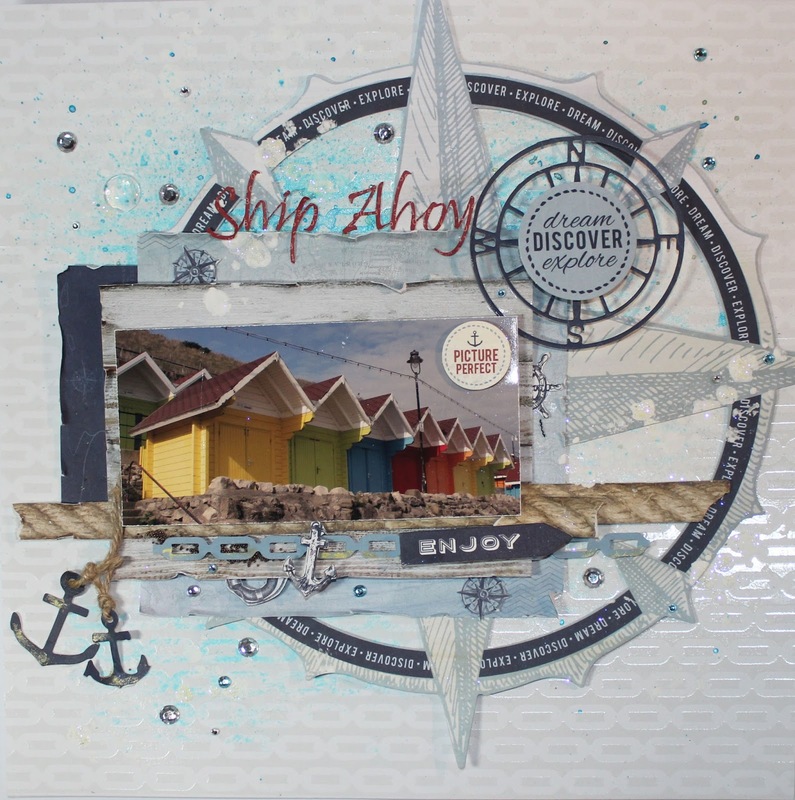 Kaisercraft products used: P1986 Starfish | P1987 Cruise | P1983 Nautical | P1980 Ship | CT844 Collectables | DD731 – Card Creations Sailing Collage dies | CD101 Cardstock Coconut Weave| KM106 Kaisermist Denim | KM102 Kaisermist Antique Gold. 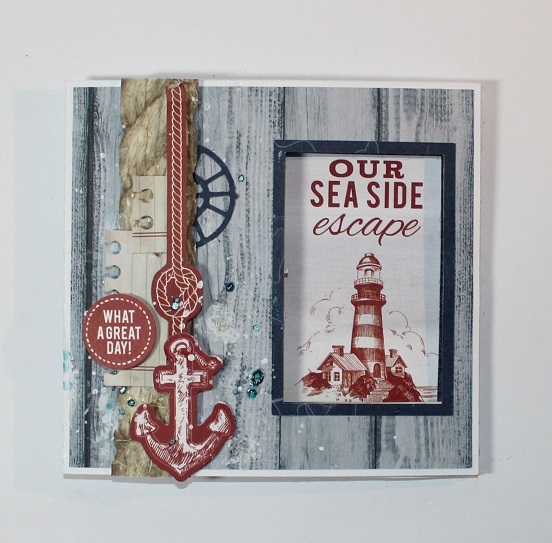 This months Sail Away collection, from Kaisercraft, is a wonderful summer collection. 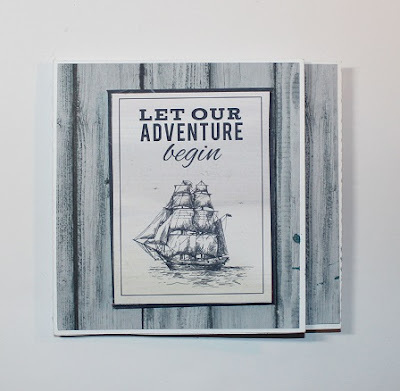 The papers are a mixture of papers with wooden structure and sea inspiration. 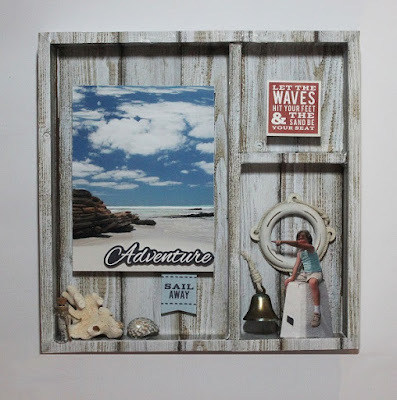 I have created a simple shadow box. 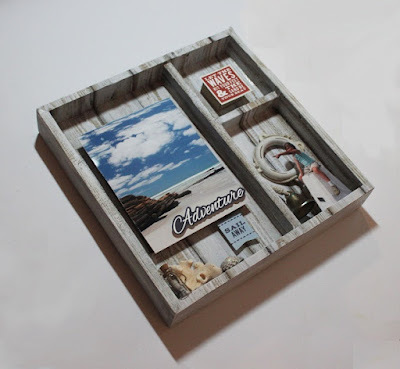 The box was originally a wooden tray bought at a second hand shop. 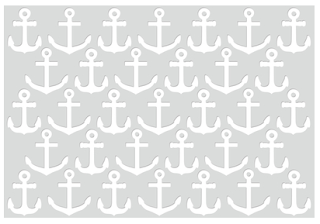 The tray was covered with the paper - P1984 Lighthouse. I added the photos, shells and the collectables. The photo of the beach, is from Kangeroo Island. This month. I am holding two Christmas card classes at Hobbykunst. 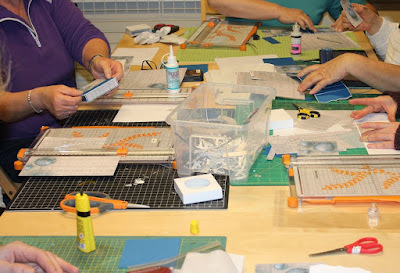 During the class, we are creating 3 different cards: a shaker card, a small tea light card and a peek a boo card. 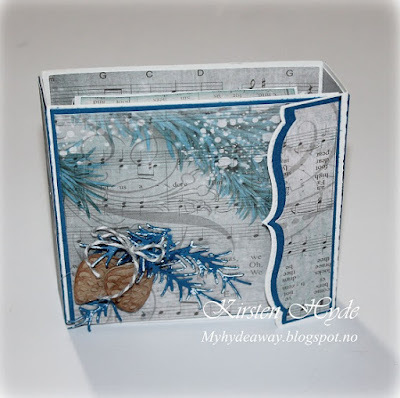 This shaker card is created with papers from the new Christmas collections from Papirdesign and Pion. The "Thinking of you" text is a die from Kaisercraft DD333. The circle is a dies from Rayher - Spring Wreath. The inside of the card is simply decorated with a text from Pion. 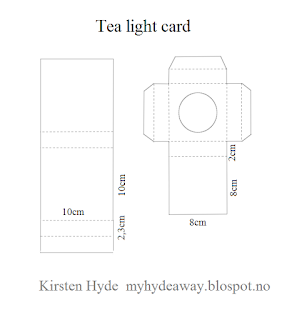 This is a small tea light card. 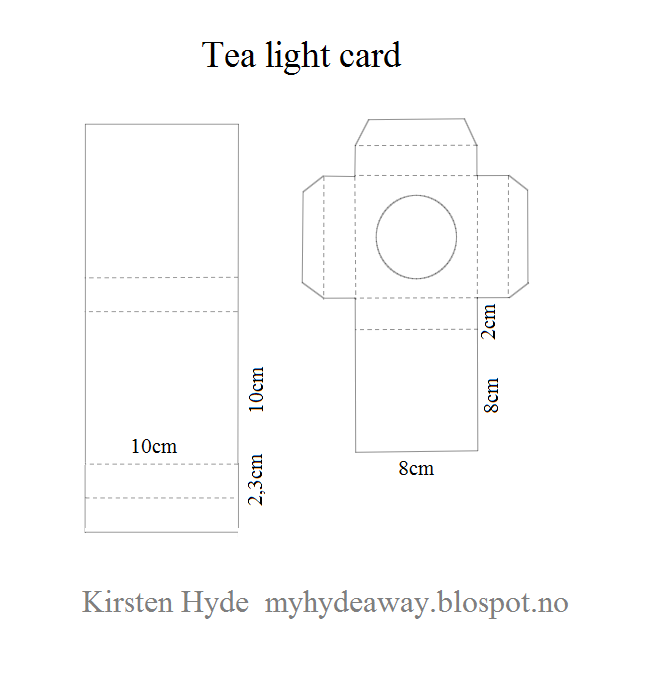 The card is only 10x10x2,3cm. I have used white and blue bazzill, and panels made with paper from Kaisercraft's Silver Bells collection - Carol. The Fir cone and branch is a die from Rayher. The edge of the card is made with a Decorated boarders die from Rayher. 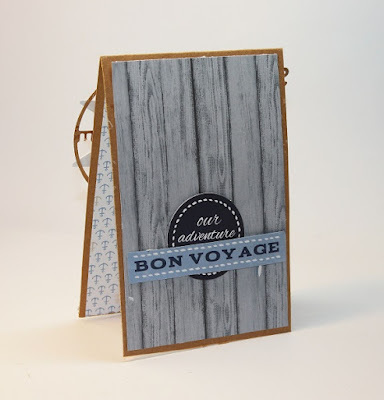 I have used a velcro lock from Rayher to close the card. The card has room for four tea lights. This card is created with Pions new Christmas papers Glistening season. The lace is from Rayher. The Peek A Boo card, is an interesting card. 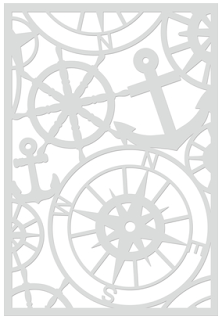 When you open the card, the image changes. When you open it, you end up with the text in the window, instead of the image. This card shows up better in the video. 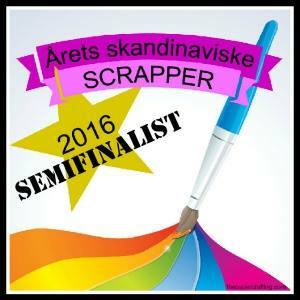 Happy scrapping, and good luck with your Christmas cards. Today, I am showing a layout created for Kaisercraft. 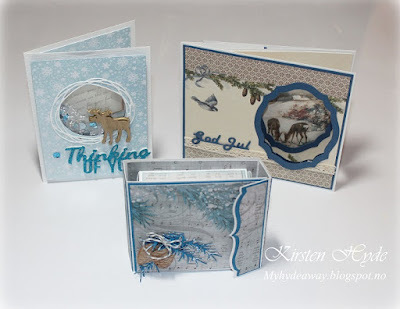 The collection used is the new Provincial collection. 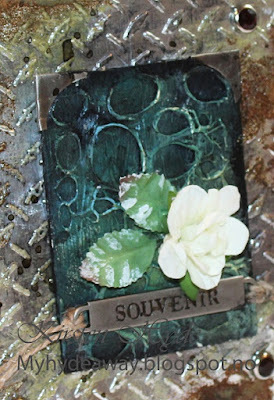 I have used gesso on the background and also stamps from the stampset. The papers has been layered. 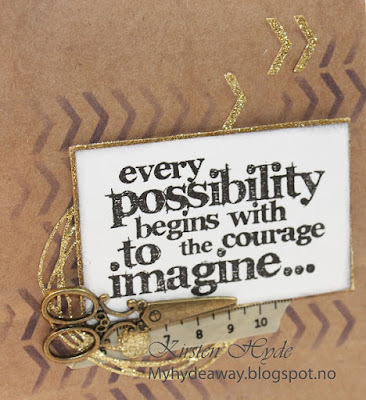 The text has been cut on a Silhouette. 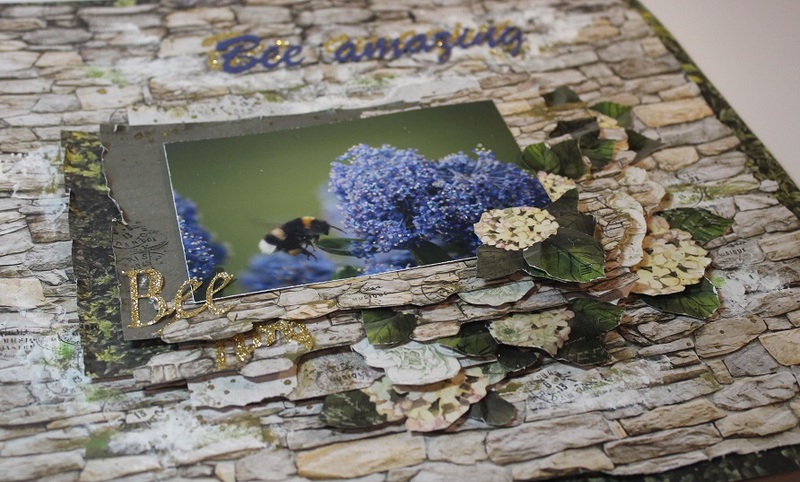 Kaisercraft products used: P1978 Cobblestone | P1972 Hedge | ‘Hydrangea’ | SS299 Sticker Sheet | CT843 Collectables | PP984 Paper Pad | CS243 Clear Stamps | IP733 Ink Pad Vine | IP730 Ink Pad Avocado | IP719 Ink Pad Black.